In this area, you have the option to customise existing fuel rates or add your own. 2. Navigate to the bottom table. If you want to edit existing fuel rates click Edit next to the fuel rate. 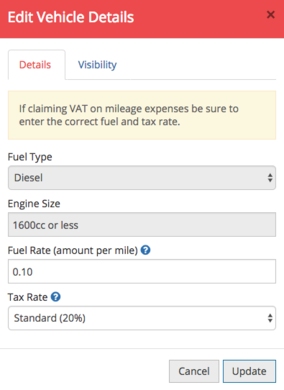 Only the Fuel Rate and the Tax rate can be changed for existing Vehicle Details. 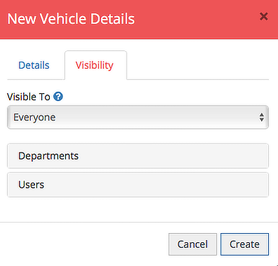 If you want to set up a new Fuel Type or Engine Size click New Vehicle Details. 3. You can change the Fuel Rate (amount per mile). 5. Navigate to the Visibility tab. Here you can decide which of your users, departments or user groups are able to access this fuel rate on their expense form. Please note: In order to calculate the VAT on mileage you will also have to navigate to the Cars and Vans mileage rate and ensure that Calculate VAT is ticked. Once you're happy, click Update to add the Fuel Rate to your account. If you would like to add your own Fuel Rate you can click New Fuel Rate.